Easter’s near, so let’s get a little religion from what might appear to be an unlikely source -- former longtime WFAA8 chief weathercaster Troy Dungan. 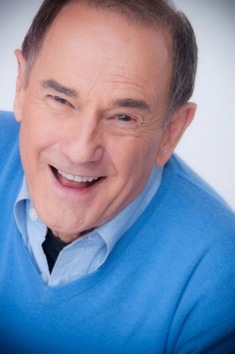 He left the station in July 2007 after 31 years of laid-back forecasts and trademark bow ties. But during his last eight years at WFAA8, Dungan also hosted a 1 p.m. bible study class on Wednesdays after first getting authorization from station management. The Baylor University graduate hadn’t been particularly interested in God until relatively late in life. But a chance meeting with Dr. Larry Poland, the founding CEO of Mastermedia International, put him on a path to Christianity. The 233-page paperback book is a conversational reboot of some of the Bible’s greatest hits. Dungan used to open his WFAA8 sessions with a 10-minute presentation before asking for prayer requests. The average audience was about 12 WFAA8 staffers, most of them off-camera personnel. Former anchor-reporter Macy Jepson used to attend on occasion, but Dungan’s best friend at the station, anchor Tracy Rowlett, had recently jumped to rival CBS11. And anchor Gloria Campos, a Catholic “Christian believer” with whom he recently had dinner, generally wasn’t due at work early enough to participate. 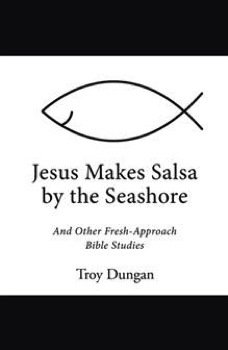 Salsa By the Seashore is available instantly as an online book for $3.99 via amazon.com. It also can be bought in paperback form for $19.99, but with a two-week turnaround. 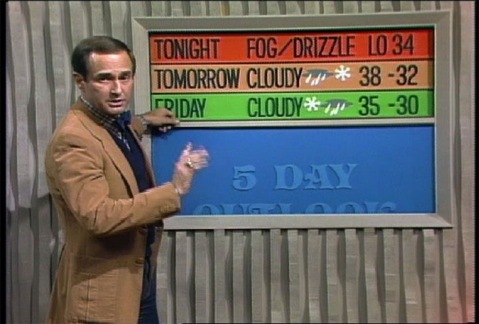 Dungan in his domain during earlier years at WFAA8. He recalls getting just two complaints from station staffers, but neither amounted to much. News director David Duitch (now director of visual journalism at The Dallas Morning News) was “very supportive” from the outset, Dungan says. By that time, Dungan says that his quieter style had gone out of vogue during those last years at WFAA8. Dungan’s current favorite meteorologists are Larry Mowry (who’s now officially left CBS11 for WLS-TV in Chicago) and WFAA8’s Colleen Coyle. He’s mainly been a product pitchman after leaving the station, save for a brief reuniting with Rowlett on KTXD-TV’s since defunct The Texas Daily, where they jabbered about the news of the day. Dungan is in his third year of selling the merits of 50 Floor in TV ads that also include former NBC5/CW33 meteorologist Rebecca Miller. On the day of our interview, the company was putting in floors at the “thank God it’s paid for house” that Dungan and his wife, Janet, have shared for nearly 40 years. Earlier spots for foundation repair and hearing aid companies dried up when the former went out of business and the latter was sold to a consortium. He otherwise has a tea towel in his kitchen emblazoned with “Home of a Recovering Weatherman.” And if he ever gets the itch, “I call my sponsor and he brings me a glass of wine,” Dungan jokes. “It’s for His greater glory, not mine,” Dungan adds over the phone. He’s got it down -- chapter and verse.